White Tara: She who liberates upon Seeing, is a profound ancient meditative practice in Tibetan Buddhism. 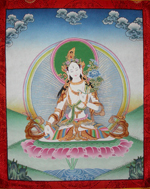 According to Tibetan Tales, White Tara and Green Tara were born from the two tears that Chenrezi she when he saw the suffering state of beings in the world. While White Tara is a central Yidam to the Karma’s and prominent in many Lineages, her ability to break through repetitive patterns, penetrate fear states and fight back illness to prolong life are her hallmarks. Through the drumming energy of her Mantra, she brings the moon and the sun energies together for health and liberation. Please join Lama Mark in the new year with a two week exploration of White Tara. This retreat is suitable for both beginners and experienced practitioners. In the tropical region of Laka Atitlan, surrounded by three volcanoes, we will explore the healing energy of White Tara to assist all beings to greater health and freedom. Price includes: accommodation for 13 nights, 3 vegetarian meals per day, unlimited tea, coffee, and filtered water, use of the temples, hot tub and all taxes. Additional costs: shared travel expenses of Lama Mark – $250 per person plus $10 towards printing of the sadhana and the Wong Kur supplies. If we receive more participants than we are anticipating then this shared travel expense will be less. These prices do NOT include dana to the teacher. DEPOSIT: $500 upon booking and 50% of the balance due 60 days before the retreat. Final payment due during your stay at the centre.